Usage has finally started to return to normal, but summer months are approaching us quickly and we expect that to change. As of today, our current inventory levels are stable, but not ideal. 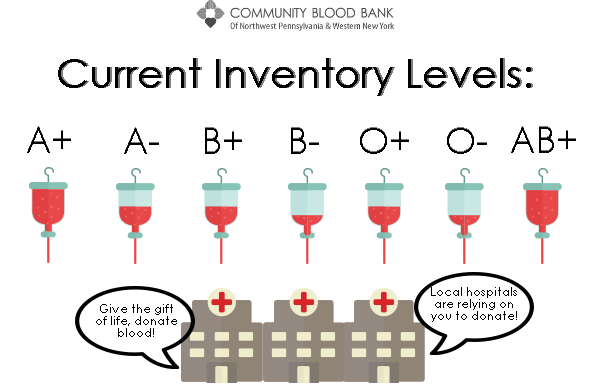 Don’t forget, your donated products have a shelf life, so donating as soon as you are eligible is a crucial to maintaining a strong blood supply. As we continue to plan new and exciting promotions (weekly and for the months ahead), you’ll continue to hear from us more than usual! Make sure you’ve updated your preferences in the Communication tab of your donor portal. And if you haven’t already opted in to recieve text messages from us, text BLOOD to 444-999 to do so. You’ll earn 50 points toward the CBB point store when you opt-in! We still have tickets available for our first ever Purse Bingo event! The event takes place on Thursday, April 13 at Perry Highway Hose Company, located at 8281 Oliver Rd in Erie. Doors open at 6 p.m., the first bingo game begins at 7 p.m.
With purses from Kate Spade, Michael Kors, Coach and more this promises to be a fun (and pretty!) event! To purchase tickets stop our Erie Donor Center during regular business hours OR use your credit card and purcahse tickets through PayPal. The PayPal link is available on our website. We hope to see you there! Team and walker registration for the Highmark Walk for a Healthy Community are now open! 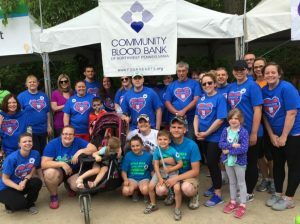 Visit http://hcf.convio.net/communitybloodbank to register as a walker, start your team, join a team, or make a donation. Make sure you keep your eye out for emails regarding this year’s fundraising events, additional walk details and challenges! We’ve already raised $2,400, let’s keep the momentum going! The walk is scheduled for Saturday, June 3 at Beach 11 on Presque Isle State Park in Erie, Pa. Registration begins at 7:45 a.m., the 5K kicks off at 9 a.m. and the 1-mile fun run (or walk) kicks off at 9:15 a.m! There is no registration, however a $30 donation will automatically get you a t-shirt from Highmark! Last year was our first year participating in the walk and our generous supporters helped us raise more than $5,700 toward the purchase of an additional bloodmobile/replacement for our Turtle Top so we can reach even more donors in Northwest PA & Western NY! The Point Store: New Items Coming Soon! Congratulations to John Schott, the winner of our $100 gift card in February! Interested in winning? One winner is selected at random from our point store drawing each month, you can enter as many times as you’d like each month OR you can redeem your points for something tangible like a coffee mug, t-shirt, or gift card. Your points are yours to use as you’d like. Keychains are here! Have you seen our debut item yet? 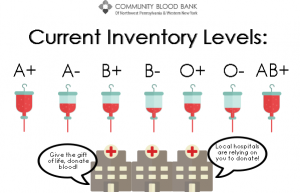 Blood Donor & Platelet Donor keychains arrived on the store this past week and we can’t wait to hear what you think of them! Wondering what’s next? We’ll give you a hint. The next new item is blue and soft! You’re familiar with our ever-changing inventory of gift cards, and by now you probably have at least one mug and several t-shirts. In an effort to keep the Point Store interesting, we’ll continue to add new items throughout the year. Have an idea for something you’d like to see? Email nicole.hornaman@fourhearts.org to have your idea considered!